Pricilla Galaviz already knows that she wants to be a missionary surgeon someday, but that didn’t stop her from sitting in on a presentation today at Grand Canyon University about labor and delivery nursing — and volunteering to act out the part of a pregnant woman. Students from high schools across Arizona attended the 29th annual Health Sciences & Nursing Day at Grand Canyon University on Friday. “Birth is really interesting and cool, and I wanted to experience how a labor and delivery nurse functions,” said Galaviz, a junior at Betty H. Fairfax High in Laveen, about her decision to attend a session by Doris Lovata, an assistant professor in the College of Nursing and Health Care Professions. 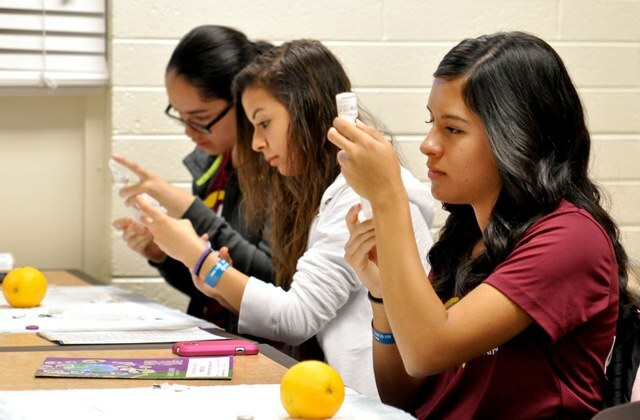 Galaviz was among nearly 2,500 students from high schools across Arizona, plus advisors, teachers and administrators, who visited GCU for the 29th annual Health Sciences & Nursing Day. 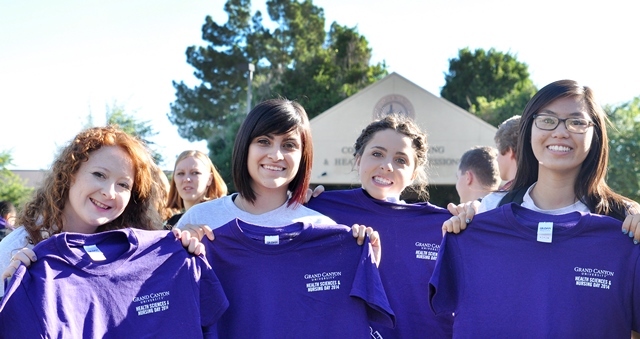 The event offered more than 100 presentations on topics from acupuncture and audiology to public health and wellness, tours of campus, including the nursing simulation and cadaver labs, and opportunities to speak with GCU faculty, staff and students. Maria Quimba, associate dean in the CONHCP, said the event enables tomorrow’s young health-care professionals to discover whether their skill sets and interests align with fields of study in health care. “It’s a taste of what the opportunities are, and it enables these students to talk to people in the field, to see what a day in the life of one of the professionals looks like and to learn about trends in the industry,” Quimba said. A day in the life of Lovata, who in addition to teaching at GCU is a labor and delivery nurse, is quite interesting. Sandwiched between two poignant videos of children being born, after which you could have heard a pin drop in a full Howerton Hall, Lovata hit on the major functions of her job. She used Galaviz and the “father” of her baby played by audience volunteer Jess Sickels, a junior at Highland High in Gilbert. During the half-hour session, Lovata described breathing techniques and motion that she employs with women in early and active labor, pain and medications to ease it, and methods to help moms and babies have the safest, best possible experiences. Sophomores, juniors and seniors in high school learned about diverse careers in health care and the academic requirements for making them possible. Beddow, program director of the University’s B.S. in Forensic Science, talked about the golden rule of crime-scene investigation — don’t touch, pick up or move anything without permission — and the goal of such work, to preserve life and evidence. “Part of the preservation of life is finding these people who are committing these crimes and taking them off the streets,” said Beddow, noting the chances of doing so escalate when crime scenes are undisturbed. She displayed examples of evidence, photographs of blood splatters, footprints and gunshot residue, and stressed that a career in crime-scene investigation requires a great deal of schooling in biology, chemistry and physics. “A lot of people think that not much science is needed because TV makes it look so easy,” Beddow said. Physics doesn’t scare Javier Dorame, a senior at Buena High in Sierra Vista, who with four other members of his school’s Health Occupations Students of America club was waiting outside Beddow’s classroom. Dorame hasn’t decided yet whether to pursue a career in chemical engineering or medicine. “I want to get a feeling for athletic training and sports medicine before I decide,” he said. There were multiple sessions about those fields, as well as one you might not expect: “Healing Harps: Using Music in Healthcare Settings.” Dr. Shannon Schumann, an assistant math professor, played the harp as students, including some of the 86 members of Metro Tech High’s Nursing Assistant Program who visited campus today, came into the classroom. Schumann and other certified therapeutic harp practitioners use their music to help all ages of patients, from premature babies to elderly people in hospice. Harp music can be used to help patients relax, breathe, manage their pain, improve physical coordination and deal with other issues, she said. Schumann talked about “Norma,” a patient with advanced Alzheimer’s disease whom she visited in hospice care. The elderly woman hadn’t moved or responded to her caregivers or family in several days, so optimism that she would react to Schumann’s music was low. But Schumann began playing a song from Norma’s generation, “My Bonnie Lies Over the Ocean,” slowly and simply, and the woman began to sing along.